The Copeland Center for Wellness and Recovery is leading the way toward seclusion and restraint free environments. A group of stakeholders has come together and written a position paper on the Elimination of Seclusion, Restraints, Force and Coercion. This is a very important topic that often affects those who are the least able to advocate for themselves. Please join with us to create a seclusion and restraints free health system. This paper reflects the Copeland Center for Wellness and Recovery’s firmly held belief that all uses of seclusion and restraints in psychiatric services be eliminated. In addition to serving as a declaration of the Copeland Center’s position on this important topic, it also aspires to stimulate an active and ongoing dialogue on alternatives to seclusion and restraints among change agents in the mental health recovery arena. The Copeland Center’s Committee on Eliminating the Use of Seclusion and Restraints, which developed this paper, continues to work on developing an action plan detailing the Copeland Center’s role and areas of contribution to this critical movement. The Copeland Center for Wellness and Recovery seeks the elimination of the use of seclusion and restraints (either physical or chemical) in all areas of psychiatric services. The Center also opposes the use of body bags of any kind, strait jackets and other devices that restrict movement, full body searches including body cavity searches, torture of any kind, the use of tasers and the use of force or coercion as treatment for emotional distress. The Center also believes the use of these methods in any area of psychiatric services should be outlawed by national and international law. For purposes of this paper, “seclusion” is defined as the involuntary confinement of a person alone in a room where he or she is physically prevented from leaving. “Restraint” is defined as the involuntary use of a manual method or mechanical device, material or equipment attached or adjacent to a person’s body that is not easily removed and restricts the person’s freedom or normal access to one’s body. It also includes the use of medication to restrain people, commonly referred to as “chemical restraints.” It does not include the self-directed use of physical holds that someone may choose to include in his or her crisis plan, advance directive or other self-determined care plan (for example, if someone asks to be held or hugged while being talked to during an intense situation). It also has been documented that direct care staff have experienced physical and psychological injuries resulting from their role in these incidents. Often staff who implement these interventions are in high stress environments yet have not received the educational and other supportive resources they need to safely and effectively defuse situations. Given the appropriate training and supports, staff would have better skills and options to utilize with individuals in intense situations and thereby avoid using seclusion and restraints. Unfortunately, a culture that perpetuates the use of seclusion and restraints remains prevalent throughout much of the mental health system. After all, seclusion and restraints have been used for centuries and have long been mistakenly considered therapeutic interventions—not surprisingly, their use has become accepted and ingrained in practice patterns. Yet seclusion and restraints have nothing to do with therapy and wellness and have no place in a recovery-oriented system of care. • In 2004 and 2007, the Substance Abuse and Mental Health Services Administration (SAMHSA) issued awards to a total of 16 states under its Alternatives to Restraint and Seclusion State Incentive Grant (SIG) aimed at reducing and ultimately eliminating the use of seclusion and restraints in institutional and community-based mental health settings. • In 2006, SAMSHA published a training curriculum, entitled “Roadmap to Seclusion and Restraint Free Mental Health Services,” to equip mental health providers with current information on prevention strategies and alternative approaches to avoid and reduce the use of seclusion and restraints. • NASMHPD’s National Technical Assistance Center has trained senior provider and leadership staff from over 46 state mental health agencies using a prevention-based training curriculum geared toward reducing and eliminating seclusion and restraints. • Most notably among state initiatives, from the mid-1990s to 2001, Pennsylvania saw its combined incident rates of seclusion and restraints per 1,000 patient days reduced by 90% and its hours of use per 1,000 patient days decline by 95% following inception of its sweeping changes. And by 2010, Pennsylvania had virtually eliminated seclusion in all of its state hospitals while the use of restraints continues to decline. • In late 2000, Massachusetts began an effort to reduce and ultimately eliminate the use of seclusion and restraints in all of its child and adolescent inpatient and intensive residential treatment facilities. As evidence of its commitment, from November 2000 to January 2005, episodes of seclusion and restraints per 1,000 patient days decreased 84.4%, 80.4% and 78.7%, respectively, in child (ages 5-12), adolescent and mixed child/adolescent units. While the Copeland Center certainly applauds these efforts and is encouraged by the progress, we remain committed to the unfinished task of eliminating these practices. To effect cultural change requires education—this will allow us to stop doing what other generations have done, as Piaget suggests. The Copeland Center’s goal is to stop the use of seclusion and restraints and is dedicated to offering its educational and technical expertise to bring about this cultural change and facilitate the implementation of new skills and problem solving strategies, new ways of working together in difficult situations. All stakeholder groups within the system of care must be involved in these transformational efforts—not just the direct care staff most closely involved with implementing these practices. A change such as we are advocating is unlikely to be realized without a clear, convincing and consistent message from top leadership and policy makers within the mental health system. With such an edict, and employing the necessary educational and other supportive resources, all parties can work together toward change—leadership and policy makers, key administrators, direct care and other hospital/facility staff, peers, family members and advocates. We welcome any dialogue or opportunity to provide educational training and technical assistance on this important shift in thinking and practice. 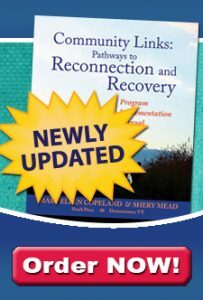 Please visit the Copeland Center website at www.copelandcenter.com on an ongoing basis to learn about future opportunities for training and additional information on this important topic or telephone us at 802-254-5335. This paper was prepared by the Copeland Center Committee on Eliminating the Use of Seclusion and Restraints, whose members include: Mary Ellen Copeland, Matthew R. Federici, Ellie Goldfarb, Erica Buffington, Carol Bailey Floyd, Gina Calhoun, Cheryl Sharp, Sarah Bourne, Audrey Garfield, Ed Anthes, Christine Allers, and Katie Wilson.